Raks Assaya (Egyptian Saidi) - Shakti Wellness Studio - Belfast, UK - Yoga, Bellydancing & Lots more! Saidi dance is a folkloric dance (one of the baladi dances) from the Sa’id, a rural area in Southern (Upper) Egypt. The dance style includes a lot of energetic bouncy footwork and horse-styled steps, and frequently incorporates a stick or cane, called an Assaya (Arabic for stick). Saidi Dance, also known as Raqs Assaya or cane dance, it is a folkloric dance. Saidi music is a variation on baladi that is specific to Upper Egypt, also known as The Said. This is the rural part of Egypt south of Cairo, located around Luxor, Assuit, Minya, and Aswan. It is currently a very popular folkloric dance, performed by men and women at festive events, such as weddings. Saidi dance originates from the male dance called Raqs Tahtib (Raqs Tahtyb) which is a stick dance performed by men, in which the men mimic the moves used in the martial art, Tahtib. In Tahtib the men use bamboo poles. It is used while on top of horses and/or in actual combat. In Raqs Tahtib, the dance, the men will dance around each other while pretending to attack and block each other. 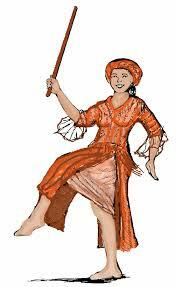 The first women to use the stick for performances were the female gypsies of Upper Egypt, called the Ghawazee. They copied moves from the men’s Tahtib as well as incorporating their own movements into the dance. The Ghawazee dancers would place the sticks between each other, pressing into their bellies, as they danced around in a circle, showcasing their hip twists and shimmies. Today, it gets confusing to know what you are looking at as there are so many different variations of this dance. There’s home style Saidi dance, Saidi performed by the local entertainers (Ghawazee), Raqs Tahib performed by men, Saidi styles coming from two different National dance companies of Egypt (including Reda style), and a nightclub version, which she calls “Cairo Style” female dance, which is most common today among women performers. Mahmoud Reda, who was the artistic director of one of the National dance companies of Egypt, took the dance to the stage, modifying the costumes and moves for the theatre, and was the first to create a women’s part. As Saidi women were forbidden to dance in public, Mahmoud was unable to witness women dancing, other than the Ghawazee dancers, and therefore had to invent the women’s Saidi dance using what he learned from the men. What is the Saidi Galabeya? It is the traditional costume of Saidi dance; it is a long Galabeya (dress). There are many versions of the Galabeya, including the men’s traditional, solid-coloured Galabeya which is often modified with added colour for the stage; a female glitzy version of a Galabeya; or a traditional Ghawazee style Galabeya costume. It’s also fine to wear a cabaret bedlah (bra and belt), especially if the Saidi piece is in the middle of a set of other cabaret songs. Saidi music uses traditional acoustic instruments, such as the ney (a type of flute), the mizmar (which resembles an oboe), and the rebaba (a stringed instrument) and tabla (frame drums with a deep sound). Folkloric Saidi is recognizable by its heavy Saidi beat (Dun tek Dun Dun Tek) and typical instrumentation. The Mizmar is the most identifiable instrument in folkloric Saidi. The Mizmar is a reed instrument that resembles an oboe in appearance but sounds like a reedy variation on a bagpipe. If you’re searching for music for Saidi dance, try using the word Mizmar or Mezmar as a search term. A typical song will open with a mizmar taksim (rhythmless instrumental solo that explores the musical range of the piece) and then the rhythm will come in strong and earthy and heavy. It’s the sound of the mizmar, more than the rhythm, that tells you a song calls for Saidi style dance. Pop songs using the Saidi rhythm are EXTREMELY common. It’s not necessary to dance Saidi style or do Raks Assaya to pop pieces just because the rhythm is present. Depending on the spirit/feeling and instrumentation of the piece (presence of folkloric instruments like Mizmar or Rebab, for instance) it’s certainly permissible.